Of course, in July 2010, this seemed an absurd matter to even be debating. Mr Cameron had only been Prime Minister a couple of months (the youngest since the Earl of Liverpool) and lead an exciting new Coalition Government, which – at that stage at least – was the source of high hopes among many people. Nevertheless, I read Mr d’Ancona’s piece with some interest. I got it wrong on that occasion. Mr d’Ancona was actually tipping the Culture Secretary, Jeremy Hunt, as the “man to watch”. I must say, I found myself unconvinced. Mr Hunt comes from a very similar background to Mr Cameron: son of Admiral Sir Nicholas Hunt, former C-in-C Fleet; Head Boy at Charterhouse before reading PPE at Oxford; ex-PR man, etc. In short, he is just a carbon copy of David Cameron. My thoughts immediately turned to Boris Johnson. Mr Johnson is, of course, not of dissimilar background: went to Eton; studied at Oxford; ex-journalist. But, if there is one thing Boris is categorically not, it is a carbon copy of David Cameron. Presentationally, the two could not be more different. Mr Cameron is telegenic, personable and has a certain ‘clean-cut’ style. Mr Johnson, on the other hand, has adopted an undoubtedly compelling media persona but he is far from telegenic. He is personable, in a slightly bumptious sort of way but – rather cannily – has carefully cultivated the impression that he is a foppish, bumbling buffoon and, where our Prime Minister rarely has a hair out of place… well, the same could not be less true of dear old Boris! Deciding to play along with Mr d’Ancona’s game – even though it was clear to me a contest was by no means imminent – it seemed Boris was a possible runner to succeed Mr Cameron to the leadership if for no other reason that he would simply present such a completely juxtaposed image and style. As well as being the highest elected Tory politician in the land prior to Mr Cameron’s accession to the premiership, Mr Johnson was also easily the most well-known Tory figure in the country (by no means hampered by a couple of highly successful appearances on Have I Got News For You). Mr Johnson possessed at that time, however, what seemed to me to be two key obstacles: Firstly, whereas most potential rivals to the PM’s mantle are able to scheme either within Cabinet or from the backbenches of the House of Commons, Mr Johnson resigned as MP for Henley upon his election to the mayoralty, thus removing himself from the epicentre of power (surely essential for anyone seriously contemplating the ‘top job’). Notwithstanding the power and prestigue of the London mayoralty, Mr Johnson had been, at that time, outside the vortex of the Palace of Westminster for two years and counting! Secondly, it is probably fair to say that he is not widely seen as “a man of substance”. His coveted media persona as a self-deprecating, mop-haired, toff with ‘foot firmly in gob’ was key to developing a rapport with the British public and giving him something akin to brand recognition. He is one of the few political figures in contemporary British politics who can be referred to exclusively by his Christian name and possibly the first person since Sir Alfred Hitchcock who is recognisable simply from his silhouette. The success of this persona, however, comes at the price of credibility. Still, it was clear that steel lurked behind the fuzzy, hair-tousling, rambling, ‘hail fellow well met’ nonsensical façade. The next day, Fraser Nelson described the PM’s remarks in the pages of The Spectator as “the verbal equivalent of a horses’s head thrown into the bed”. It is hard to disagree with that analysis. The Mayor seemed to take the hint and by the New Year people were talking about ‘BoCam’, as the Mayor and the PM put up a united front when the trade unions where threatening to stage industrial action designed to disrupt the upcoming royal wedding and the 2012 Olympics. I doubt that their rivalry approaches the same heights and vicissitudes as the immortal Blair-Brown vendetta that existed throughout Tony Blair’s premiership. One suspects the dynamic of the two relationships are very different (Messrs Cameron and Johnson have very similar backgrounds and viewpoints, pointedly unlike Mr Blair and Gordon Brown). Also, one suspects Mr Johnson has far less reason to be bitter than Mr Brown, given the absence of any Tory version of the so-called ‘Granita pact’ for Mr Cameron to dishonour. That said, in June of this year Benedict Brogan reported in The Telegraph that David and Samantha Cameron had hosted Boris and his wife, Maria, at an intimate dinner at Number 10. The ‘Downing Street deal’ perhaps? It does seem, on the face of it, that Mr Johnson has put aside any thought he may have had of taking on Mr Cameron directly, at least this side of winning a second mayoral term. There also seems to be an unspoken recognition on the part of Mr Johnson and his backers that two terms at City Hall is the minimum requirement for him to convincingly shed his superficial, blustering ‘BoJo’ image. Mr Johnson’s main rival to the leadership post-Cameron would appear to be the Chancellor of the Exchequer, George Osborne. His comments on Greece certainly seemed designed to show the Chancellor up. Or is that too cynical? He’s since gone on to hammer Mr Osborne on tax cuts (specifically the 50p tax rate and National Insurance). A year on from Mr d’Ancona’s article and, to my mind, the question remains: What is Boris up to? Labour, by rights, should be walking away with the mayoralty but it does not seem to be going to plan for them, For reasons best known to themselves, Labour have readopted Ken Livingstone as their candidate – an astonishing decision. Here is a man whom Boris has already beaten to this job once before and, if recent polls are to believed, a full fifth of Labour’s own voters in London would rather see Boris stay on than Red Ken come back. Ah well, there you go. If Mr Johnson is re-elected Mayor of London – and thanks to Labour’s curious electoral strategy of nominating a candidate they already know the incumbent can beat – I think it highly likely that he will, then I would say ‘watch this space’. Last month my colleague, David Vaiani, asked a similar question: “What is Boris up to?” It was certainly Mr Vaiani’s impression that Boris was pitching to the Tory faithful and that Mr Cameron should watch out. I do not think that Mr Cameron has anything to fear from Boris. If Mr Cameron fails to secure a Conservative majority at the next General Election then it is his parliamentary colleagues he will need to fear. When a young MP was first elected to the House of Commons many years ago, he plonked himself timidly on on the green benches next to Sir Winston Churchill. Staring across the chamber at the Labour MPs sat in front of him, he remarked to the great man “Ah, so there are the enemy”. Sir Winston growled, “No, young man. That is the Opposition. The enemy are behind you.” As C. D. Marsden pointed out on this website recently, the Tory Party has a history of scalping its leaders and when they fail to deliver the goods. The next GE is scheduled for 2015. 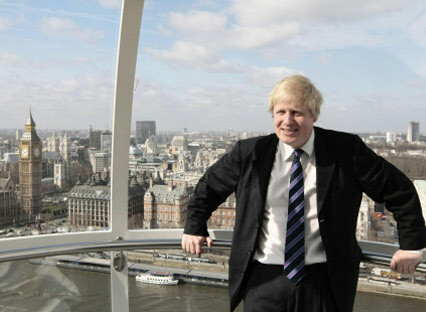 Assuming he’s been re-elected, Mr Johnson will be in the final year of his second four-year term as Mayor of London. If he started casting around for a safe Tory seat and stood down early then I think both Mr Cameron and Mr Osborne could take that as a declaration of intent.